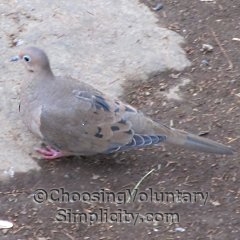 One of my very favorite birds is the mourning dove, Zenaida macroura. 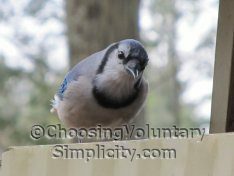 I counted forty-six of them a few minutes ago as they flew back and forth to our platform feeder, perched in the trees, and picked up pieces of corn and sunflower seeds off the ground. We feed them cracked corn, black sunflower seeds, and white millet, and the amount they can consume in a day is quite amazing. Many of the birds have become so used to us they will eat from our hands. 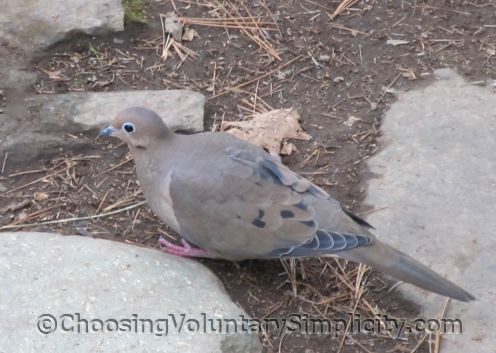 Mourning doves look like pigeons, but they’re smaller and their bodies are less rounded. My bird books describe them as being about twelve inches long, but the doves we have here are much smaller… probably closer to eight inches, if that. 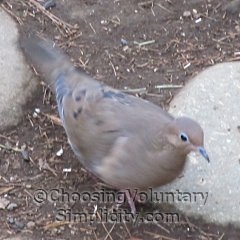 They range in color from tan to a soft grey brown and have random small patches of darker color on their wings and head. Their surprisingly loud cooing call is oddly similar to the distant sounds of bears calling to each other, and their wings make a distinctive whistling sound as they take flight or land. 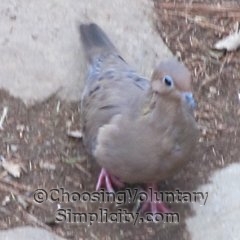 Mourning doves mate for life and usually raise two or three broods of babies each year. They are known for making flimsy nests out of twigs (usually in the crotch of a tree) and often will lay their eggs in another bird’s abandoned nest. We have even had mourning doves build a nest and raise babies on a ledge inside our shed. Both birds take turns sitting on the two small white eggs. After fourteen to fifteen days the baby doves hatch and will be fed “crop milk” until they are old enough to digest seeds. In the spring and summer we often see baby mourning doves being fed by the parent birds at our feeder shelf while they are still too young to eat seeds by themselves. I love these little birds too. Last year we had one build a nest in the top part of our enclosed open front porch. We installed a mirror slanted so we could stand on the porch and look into the nest. We were able to see the eggs, the newly hatched birds and the birds as they grew. It was fascinating. This is a wonderful blog. We added a large shelf bird feeder this year and we too have mourning doves eating off the shelf. Only 6 so far but they’re fun to watch. They seem such a gentle bird. I’m surprised at how aggressive they can be. We feed black sunflower seeds too and corn. Both have risen drastically in price over the winter. I think I have heard that cooing sound you mentioned, although I didn’t know what it was. I also think I have heard that loud sound as they start to fly. I will be more observant next time. Nice article and photo’s! 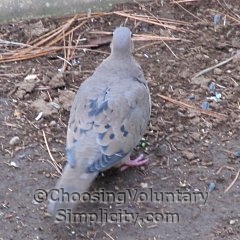 I found a small mourning dove lying beside the road when I was walking one morning. It had been hurt and had a bloody wing and chest. I brought it home and took care of it for several weeks until it recovered. We still see that dove from time to time. It is easy to identify because it holds its wing oddly but it seems to be healthy and flies and everything.